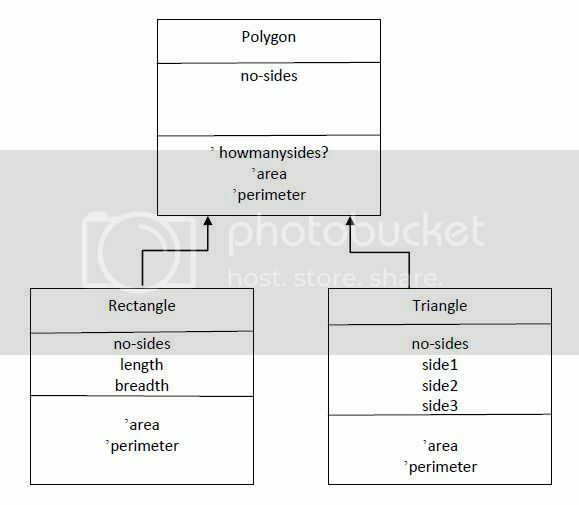 Consider three classes polygon, rectangle and triangle, where polygon is the superclass and rectangle and triangle are its subclasses. Complete the implementation of the rectangle class which takes three arguments no-sides (number of sides), breadth and length to create a rectangle object. The rectangle class is a subclass of polygon class. 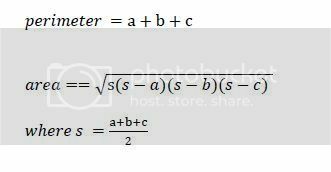 Implement messages area and perimeter for the rectangle class using the formulae given below. Complete the implementation of the triangle class which takes four arguments no-sides (number of sides) and the three sides of a triangle a, b and c to create a triangle object. The triangle class is a subclass of polygon class. Implement messages area and perimeter for the triangle class using the formulae given below.